So you are all set for your ski holiday and are putting together your ski kit. But you don't know much about ski jackets? Worry not, for I have you covered. The ski jacket is one of the most important pieces in your ski kit and it needs to be hardwearing and with a practical design, capable of keeping you warm in even the most extreme cold weather conditions. Listed below are seven technical features that you need to look for while buying a new ski jacket. Waterproof fabric and breathability: This is the most important feature to look for in a jacket. A waterproof jacket will block out the rain and snow. But when you are skiing you will perspire and if the jacket is not breathable, you will be drenched in sweat. That is why the fabric needs to be breathable in addition to being waterproof. Gore-Tex is the most popular waterproof & breathable fabric for outdoor apparel. It is lightweight, repels water while allowing perspiration vapours to pass through making it an excellent waterproof/breathable fabric. Jackets which make use of the Gore-Tex technology tend to be lightweight, breathable & waterproof thus enhancing the overall enjoyment of your skiing experience. Simply Hike has a wide selection of ski jackets from a number of top brands including North Face, Salomon, Schoffel and others. 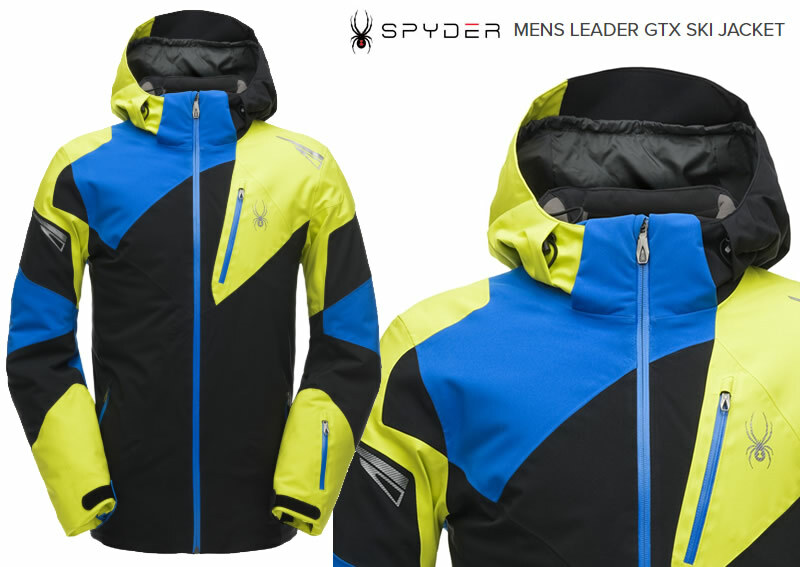 The Mens Leader GTX Ski Jacket from Spyder (featured below) is a good option if you are looking for a Gore-Tex waterproof jacket. It has a number of ski-friendly features that aim to ensure you are dry, warm and comfortable all day long on the slopes. Taped seams: For your ski jacket to be totally waterproof, the pinprick holes from the stitching need to be covered, so that water doesn't leak through the seams. This is achieved by a process where a machine is used to bond/melt tapes over the seams making the jacket completely watertight. Jackets with taped seams are the best for skiing especially if you are going to be out in all kinds of weather. Underarm ventilation: Most jackets designed for active outdoor use feature ventilation vents. These aid in breathability and help you to stay cool. So, while choosing a jacket, look for the presence of underarm zippers. These are important as they help regulate the temperature when you are skiing. Pockets: All types of jackets come with outer pockets either with flaps or with water-resistant zips to keep things handy but in a ski jacket you will need some additional pockets. Check that the jacket has inner security pockets to keep valuables safe and either an arm or wrist pocket to keep you ski pass handy. A number of pockets would mean that you have plenty of room to carry all the essential things needed for your day on the slopes. Adjustable cuffs: Most ski jackets have adjustable elasticated cuffs which ensures a great fit. In some models you might also notice internal snow cuffs, usually made from some kind of stretch fabric), to keep the snow from getting inside the sleeve. Powder Skirt: Most jackets have a hem drawstring which can keep the wearer fairly snug and prevent snow and cold air from blowing in. Newer models come with a 'Powder Skirt' or 'Snow Skirt' which is basically an extra piece of material on the inside of the jacket which can be fastened to prevent snow from entering at the bottom of the jacket. This feature is especially handy if you happen to fall as it helps stop snow from shoveling up your back. The Snow Skirt can be fixed or detachable. Fit and shape: Once you have decided on all the technical features, it is now time to look at the fit, shape, and colour of the jacket. Ski jackets come in a range of styles - fitted silhouettes, longer styles, padded ones etc. Make sure the jacket you choose fits you comfortably. It should allow freedom of movement. Ski jackets usually come in an array of bold, bright colours (neons) and patterns. Pick one that you will like wearing and can wear off the slopes too. But the fashion aspect of the jacket should be the last thing to consider, I feel. Because fashion can never or shouldn't trump functionality. First and foremost, your ski jacket should keep you dry, warm and safe. The style/fashion is an added bonus. In addition to the seven features listed above, other things to take into consideration include the hood (space and adjustability), the zips (quality, pull tags), neck and chin guard etc. Now that you have some idea about ski jackets and its features, I am sure you will be able to make an informed decision when you decide to buy a ski jacket. This post is in collaboration with Simply Hike. All views, as always, are solely my own.